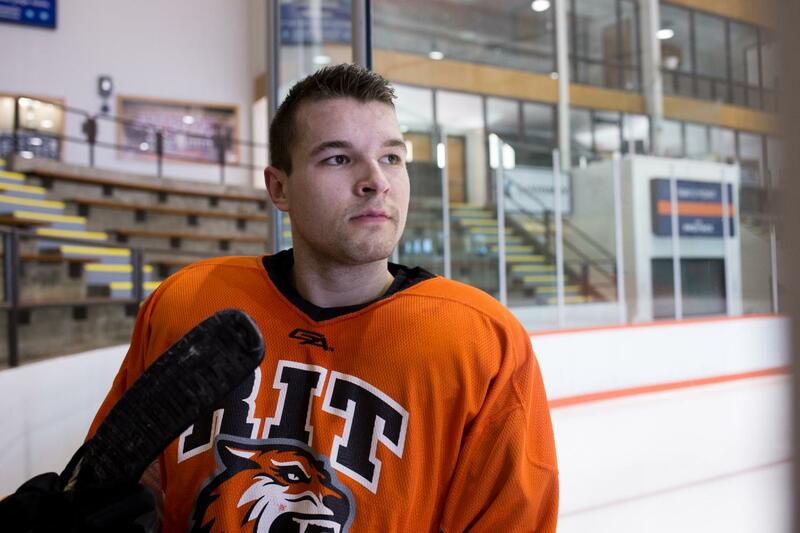 For the third time in RIT hockey history, a member of the men’s team has secured the prestigious Atlantic Hockey Conference Rookie of the Year award. Defenseman and first year Marketing major Adam Brubacher impressed coaches and peers alike with his outstanding performance this past season. Although this year marked his first appearance on the team, Brubacher was thrown into a prominent position very early on. “I took it upon myself to take more of leadership role after we had some injuries on the defensive end,” he explained, referring to the unfortunate absences of defensemen Matt Abt and the Norrish brothers, Chase and Brady. Not only was Brubacher’s defensive play consistently strong, but he also managed to rake up a phenomenal 23 points this season. “I think my all-around play — from defense to chipping in on offense — really stood out,” he said. Beyond dazzling the conference, Brubacher’s initiative also impressed head coach Wayne Wilson. "He did very well on the power play as well, he moves the puck very well, and he’s just a very smart player." Although the team’s season may have come to an early conclusion with a disappointing loss to Niagara in the first round of the Atlantic Hockey Tournament, the team is already hard at work getting ready for next year. In order to effectively prepare for the upcoming season, the team’s training thus far has been remarkably diverse. “Our trainer Nate has us doing a lot of functional movements as well as strength conditions,” Brubacher explained. “That’s a big part of what we do to increase our mobility on the ice, which translates to better performance.” Brubacher is hopeful that the extra training, when paired with the team’s already strong roster, will result in a successful 2017–18 season. “I think our defensive skill line and our core will be very good,” he said. “We’ll have the Norrishes back, Matt Abt as well, and four freshmen who really had to step it up when they were out — I think that will really help.” Brubacher is also excited about the new talent the team has recruited. “I think we have a good core group of guys coming back that are motivated to do well and move on. We also have a good group of guys coming in,” he explained. “We have nine new freshmen coming in as well as two new goalies. So that’s a lot of opportunity for them.” While he believes the team has a great foundation, Brubacher would still like to see the them grow in some areas. “I think overall defensively we can improve,” Brubacher said. “We need to keep our shots against low, and obviously goals against low.” Brubacher also aspires to make some adjustments in his own performance. “For me personally, I’d like to continue to work on my skating, always improving my defense and just overall skill,” he explained. “I’d also like to keep producing offensively, keep producing on the power play.” Wilson is hopeful that Brubacher will continue to hone and develop his leadership abilities as well. “He’s already very well-respected in the locker room and I’m excited to see him grow his skills in that area,” Wilson said. "I'd also really like to start a career in professional hockey, and I hope this is the path that leads me there." However, Brubacher won’t have to worry about achieving his ambitions alone. Even as a rookie, Brubacher felt immediately welcomed by the team’s supportive nature. “It’s always a good family atmosphere, everyone’s working towards a common goal,” he said. “That’s always nice to see as a first year, and hopefully that continues in my four years here.” Brubacher will also have the help of the coaching staff to count on. From just his first year season alone, Brubacher has certainly established himself as a player to watch. And with the return of other seasoned hockey veterans, the 2017–18 season promises to be very exciting indeed.